Halloween Week on Gee Whiskers! / Gee Whiskers! Halloween Week on Gee Whiskers! I have always loved the idea of celebrating Halloween and as a child I often wished that we had this holiday in South Africa. I love the idea of everyone dressing up and decorating their houses. But sadly I have never actually celebrated the holiday and this year I have the perfect excuse to join in the Halloween fun - Essence were kind enough to give me two R500 Essence hampers to give away on my blog. Each hamper contains some really fun and pretty makeup which I personally wish I could keep - but at the same time I am so happy that I get to brighten up two people's days soon. To accumulate entries use the raffelcopter gadget below. This week I'll be sharing some fun Halloween posts - an Essence Halloween makeup look, manicure and one of my favourite Halloween bathtime treats. So keep your eyes on the blog and please share your Halloween looks with me! The week will end of with the winners of the hamper being announced. Come back tomorrow to see my Essence Halloween makeup look! If you are having problems capturing entries in the Raffelcopter gadget you can gather your entries by commenting on the post letting me know if you follow @essence_ZA on Twitter and like their Facebook page. You can also earn entries by following me, @Gee_Whiskers, on Twitter and tweeting about the competition. Awesome competition! I'm @Painted_Fingers on twitter. Happy Halloween! I love Essence! Fantastic Giveaway! 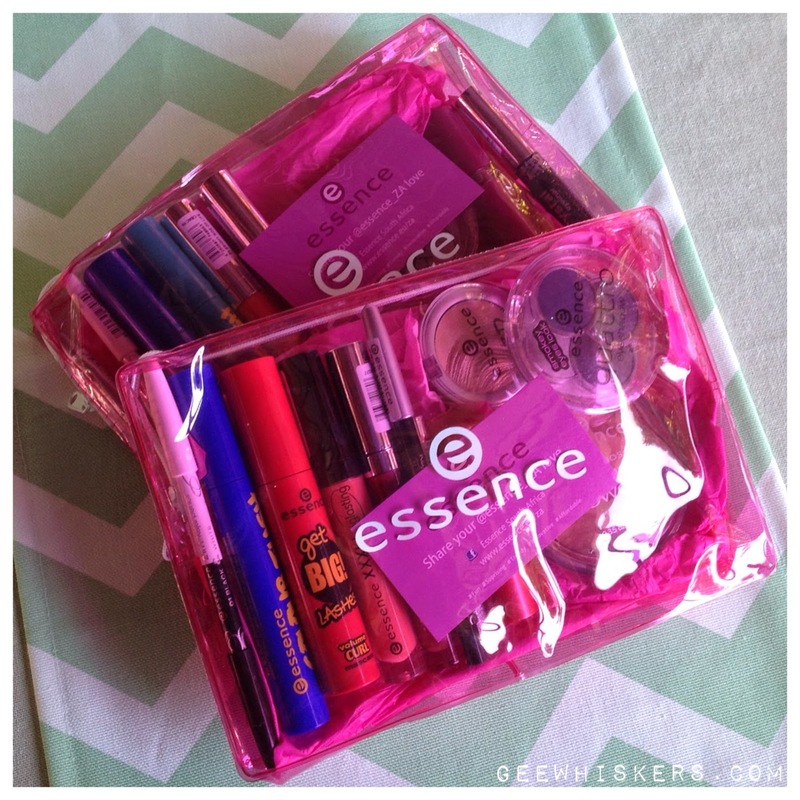 These Essence hampers are gorgeous. Such a nice giveaway Charlene! I follow u and Essence on twitter @tracyjacobs9. Sorry if this is a duplicate. I have just come across your blog! I am intrigued by your posts. Will definitely be coming back to read your upcoming posts. What an awesome giveaway from essence too. Awesome products. What a geart variety of products in the Essence hamper.